Dubai: Real gross domestic product (GDP) growth in the Gulf Cooperation Council (GCC) is expected to moderate in 2019, with production cuts impacting the oil sector and only a limited strengthening in the region’s non-oil economic activity, according to economists. Analysts expect the outlook for non-oil growth to be modest in 2019 although activity picked up in 2018 following higher government spending on the back of higher oil prices. While the governments are likely to continue to keep higher public spending in 2019, lower oil prices are expected to exert pressure on fiscal positions. “If another oil shock hits, access to financial markets will become more difficult. The risk profile of borrowers will increase with lower prices and weaker balance sheets. This may force some governments to slash spending more aggressively than in 2014,” said Ziad Daoud, Chief Middle East Economist for Bloomberg Economics. Economists expect to see deflation in the UAE and Saudi Arabia in 2019 due to the impact of the introduction of VAT dropping out of the inflation data and to the fall in rental prices. The latter reflects key challenges in these economies, notably regarding the oversupply of real estate in the UAE and job losses in Saudi Arabia. “Gulf economies are more vulnerable to a collapse in oil prices today than during the last rout in 2014. Debt is higher, foreign exchange reserves are lower and the chance of pooling resources is smaller. A sharp drop in oil prices could prove more damaging this time around,” Daoud said. Government spending being the main driver of any uptick in non-oil growth various headwinds facing private activity, dampening the pace of recovery. The soft domestic demand backdrop following the last few years of fiscal consolidation and pressure on corporate margins also limits private expansion plans, and the outlook for slowing global growth provides an additional headwind to externally facing sectors. “Most GCC budgets are prioritising current spending, likely aimed at supporting employment growth, though increasing investment activity also remains a central objective for most regional economies. 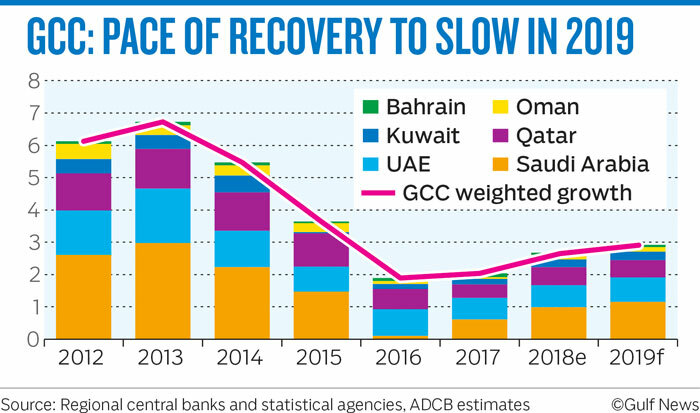 However, we believe that it will take time for investment momentum to build as all GCC countries saw a fall in the value of projects awarded in 2018,” said Thirumalai Nagesh, an economist with ADCB. 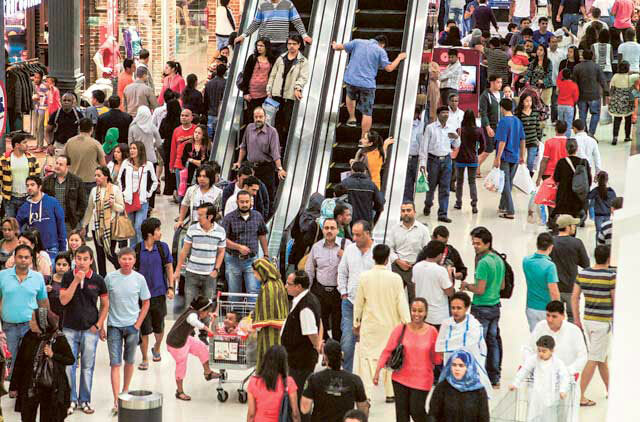 Economists expect private consumption to remain weak across the GCC in 2019 although some support is from higher government spending on wages and limited new fiscal reforms. All of the GCC budgets released so far for 2019 indicate higher current expenditure, especially on wages aimed at supporting sentiment and promoting national job creation. Saudi Arabia reinstated annual public bonuses to all state employees from the start of 2019 and extended the public sector handout package for citizens (introduced in January 2018) for another year. One key element of the Dubai budget is spending on job creation (2,498 additional positions) with government spending on wages and salaries expanding by about 7 per cent in 2019.